She gave birth just over two month ago. But Kylie Jenner seems to have already lost her pregnancy weight. The 22-year-old model posted various videos of herself painting on lipstick and flaunting her toned stomach to her Snapchat on Tuesday. 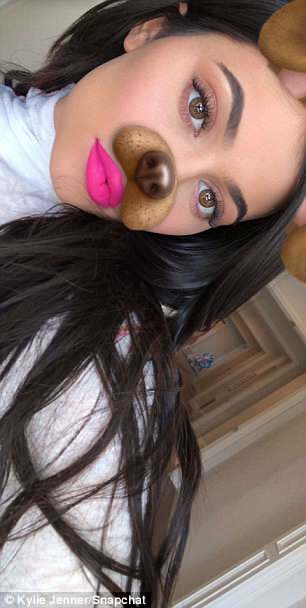 The clips were social media marketing for her new lip kits, 'These colors just dropped, so check out the site,' she told her followers. 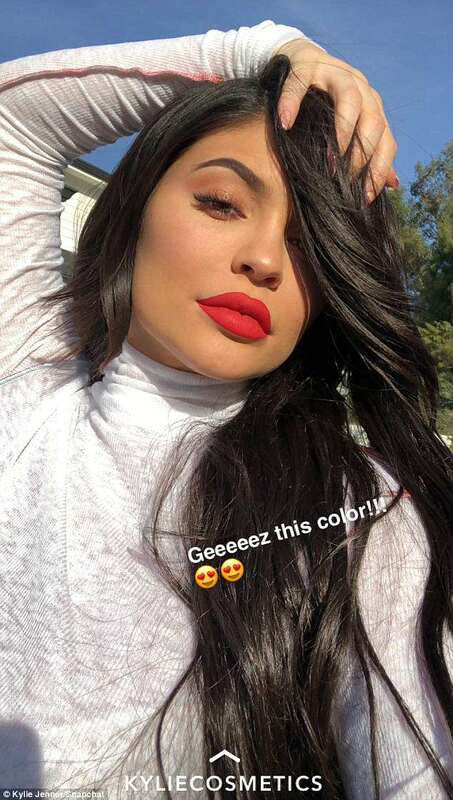 Dressed in a cropped white top and black nylon track pants with an elastic waist, the Keeping Up with the Kardashians star painted her lips a variety of colors, including red, pink, and a light brown. The entrepreneur flashed her tight torso and tugged on her waistband. She turned the social media platform's dog filter on and off as she displayed herself both inside and outside leaning on a vehicle. In September of last year, it was first reported that the reality television personality was expecting her first child with rapper Travis Scott. On February 6, Kylie announced on her Instagram that she had given birth to her first child Stormi Webster on February 1. Jenner has granted ex-boyfriend Tyga's wish for Stormi to undergo paternity testing, according to reports. 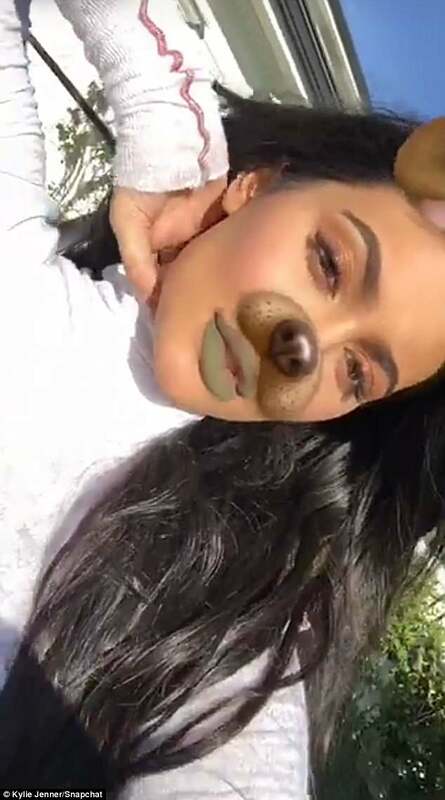 Following claims the Hookah rapper was demanding confirmation as to who the father of the two-month-old is, The Sun published an article alleging that Kylie, 20, agreed. 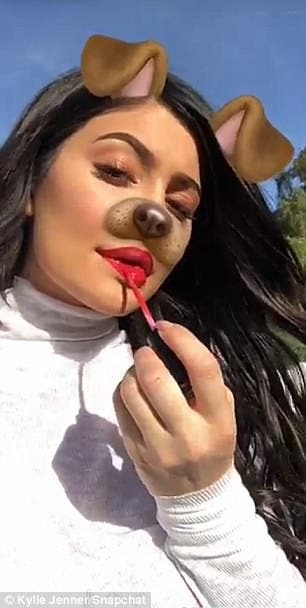 The publication's sources said that by the time Tyga took to Twitter to set the record straight about the rumors, the makeup mogul had already gotten the test done and she and her family were 'irate' to see him speaking on the matter. 'They are furious with Tyga because he promised Kylie if she gave him his wish and took the paternity test, he would never talk about being the baby's father again,' the insider said. According to the outlet, the tweet storm from Tyga was a direct result of the paternity results, which apparently confirmed rapper Travis Scott as the child's father.